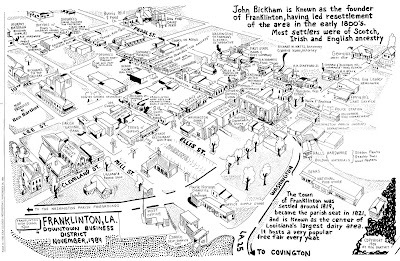 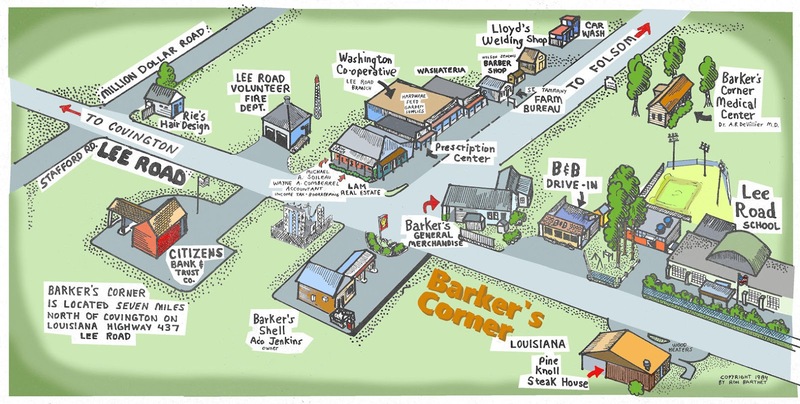 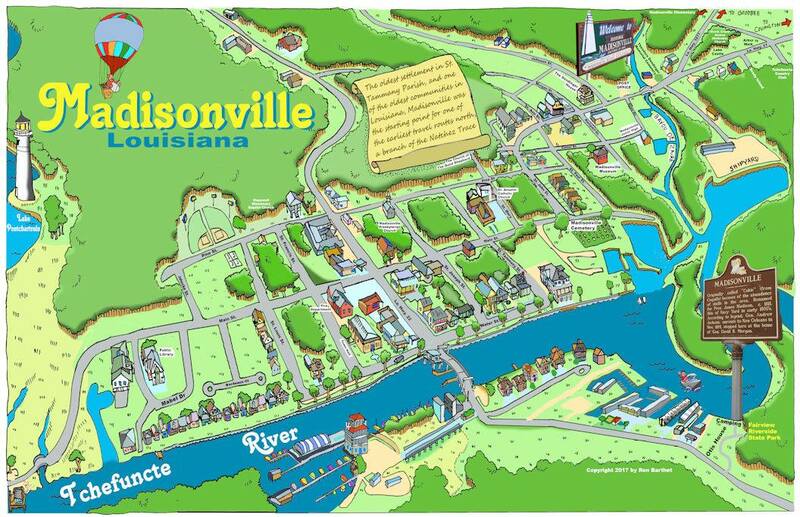 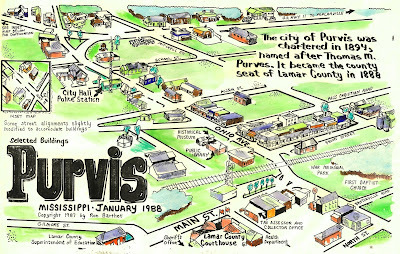 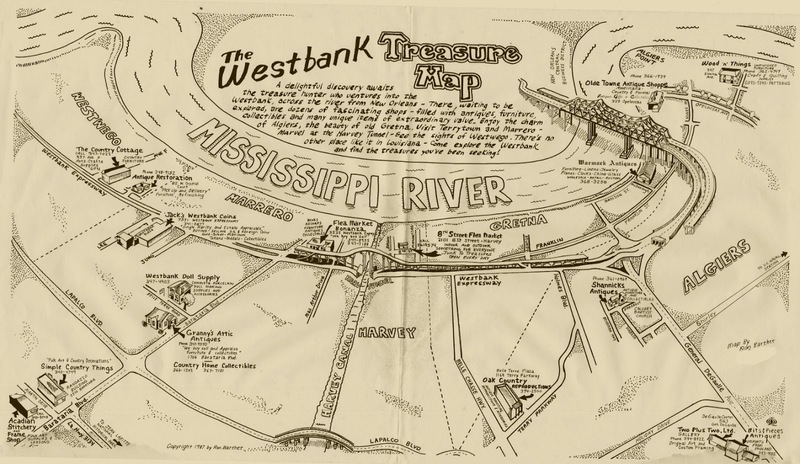 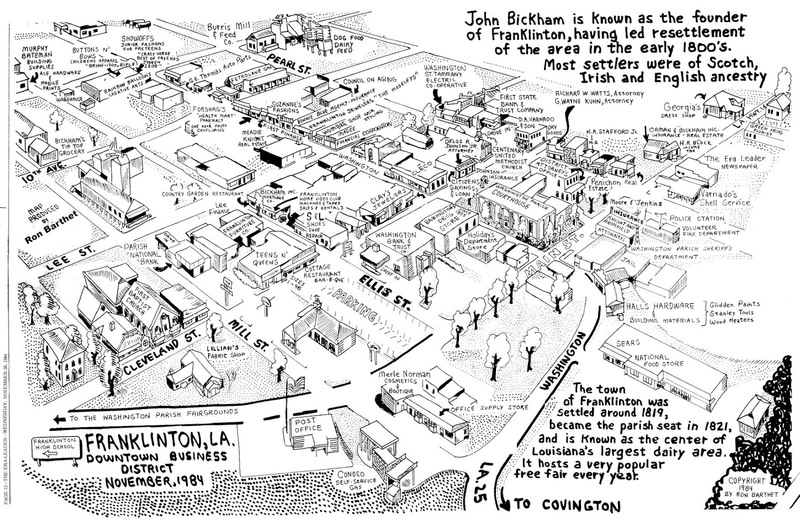 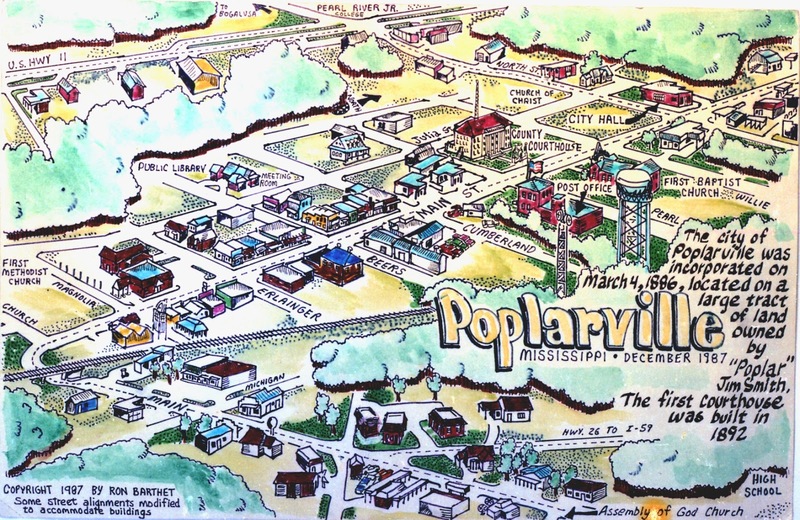 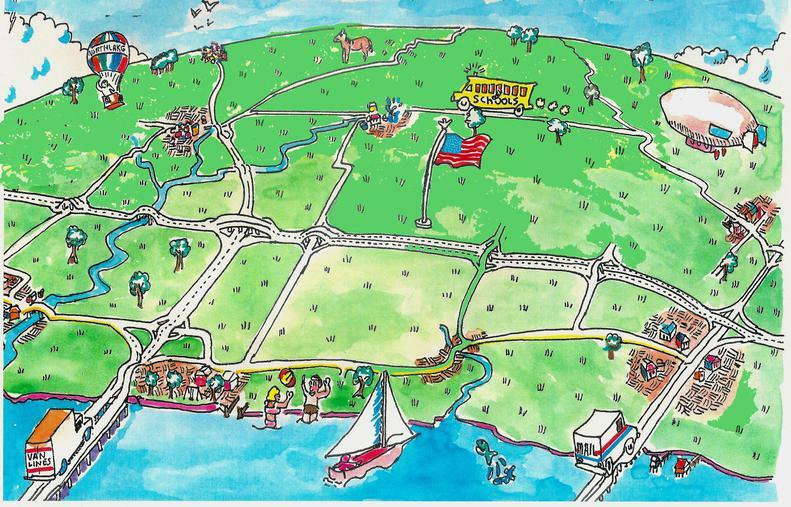 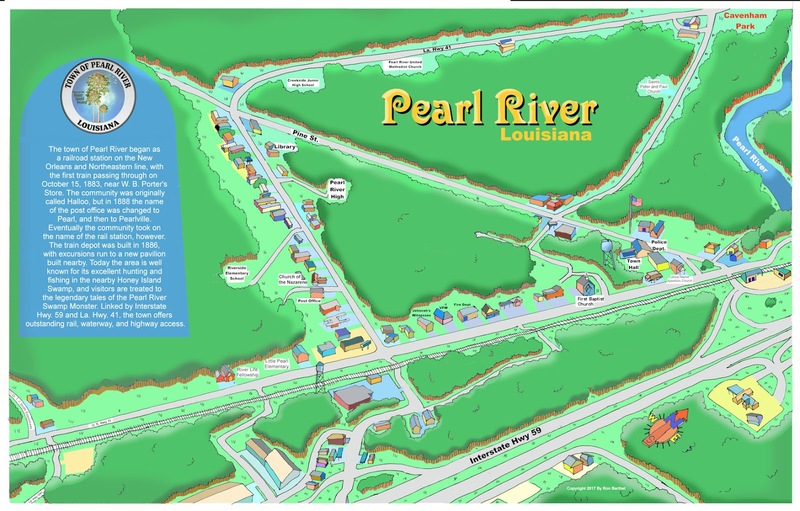 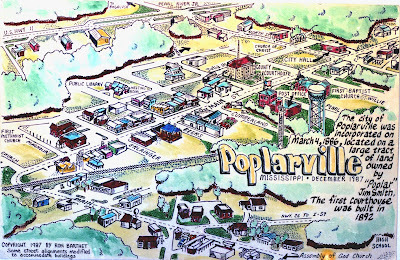 This webpage features a variety of community pictorial maps and other artwork by Ron Barthet of Covington, Louisiana. 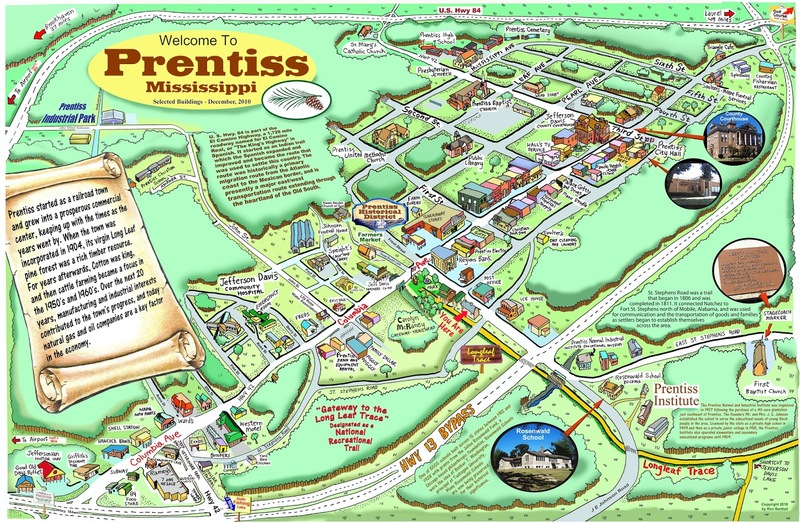 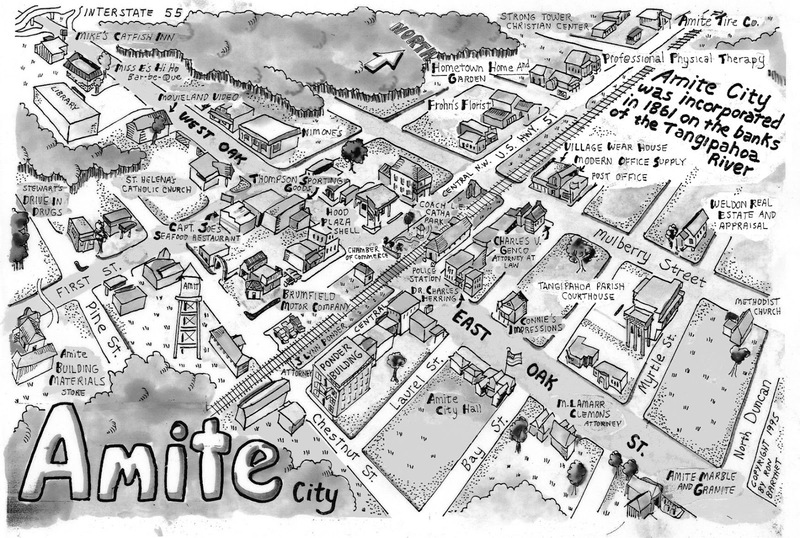 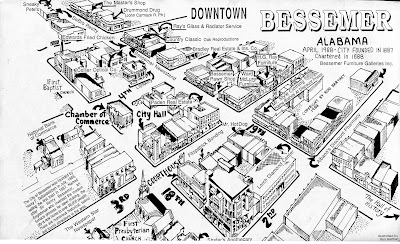 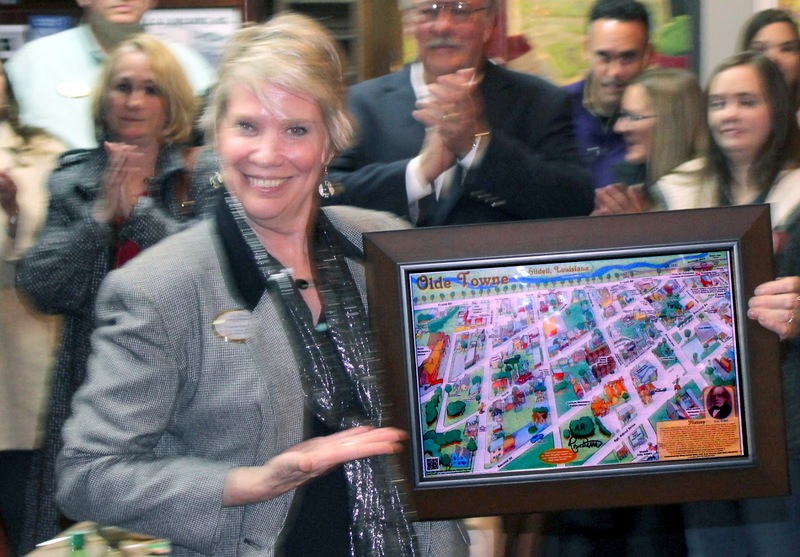 Over the past thirty years, I have produced more than 50 maps of small towns, primarily downtown business districts and other specialty works of art illustrating the importance of local community history. 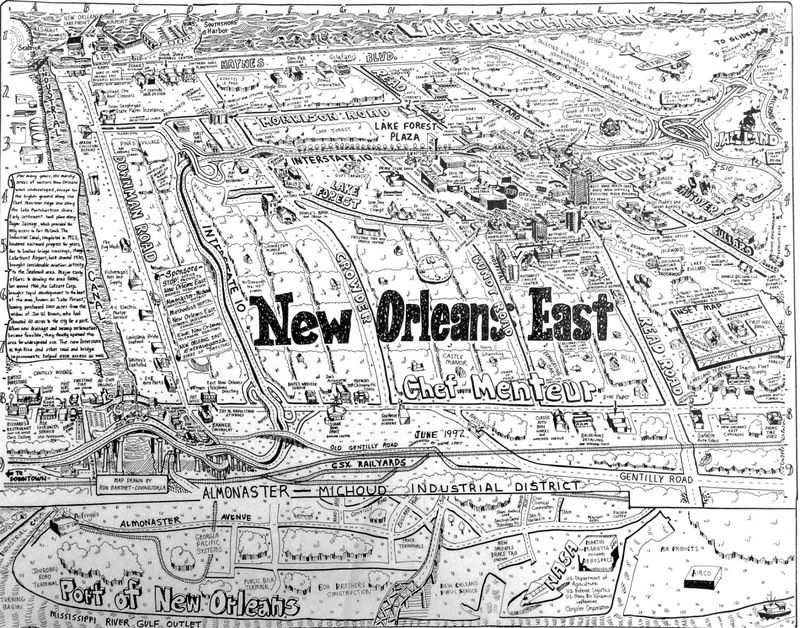 CLICK ON THE MAPS to make them larger. 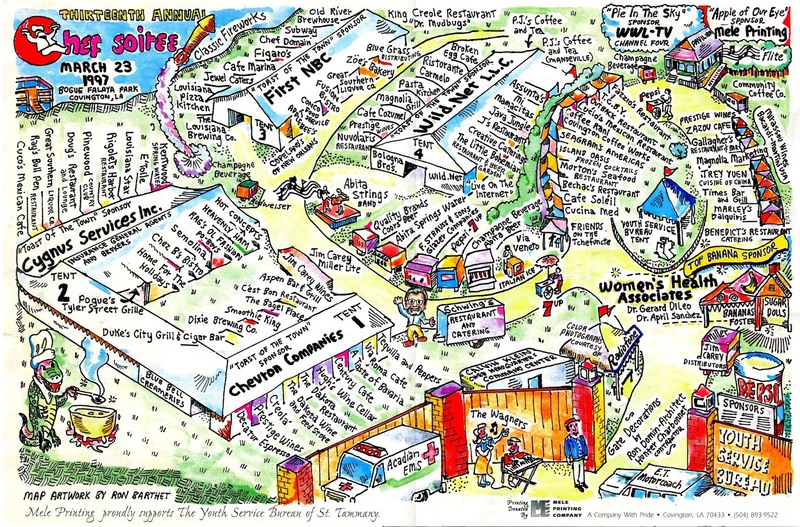 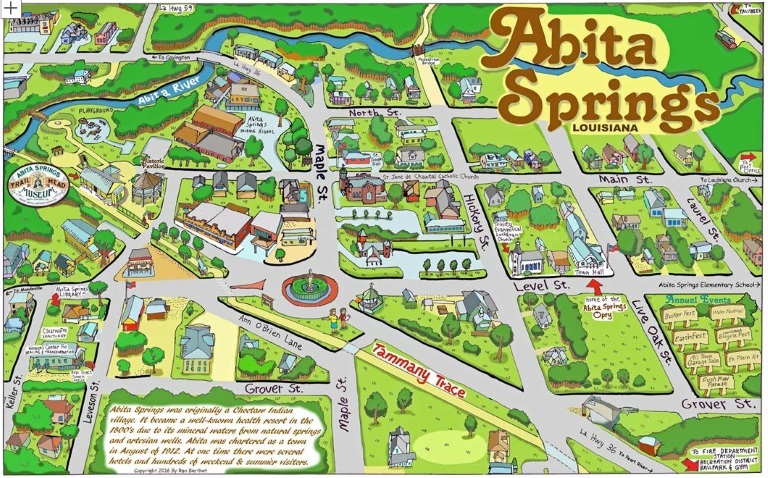 This Abita Springs map, drawn in 2016, was done at the request of the Abita Trailhead Museum, which needed a large poster copy for its exhibit room. 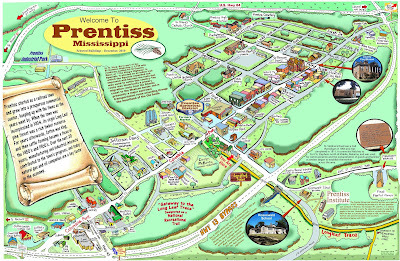 The museum also sells 11 x 17 inch copies of the map as a town souvenir for interested visitors. 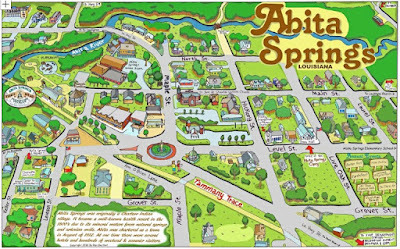 I had drawn an earlier map of Abita Springs in 1986 which is still popular today. 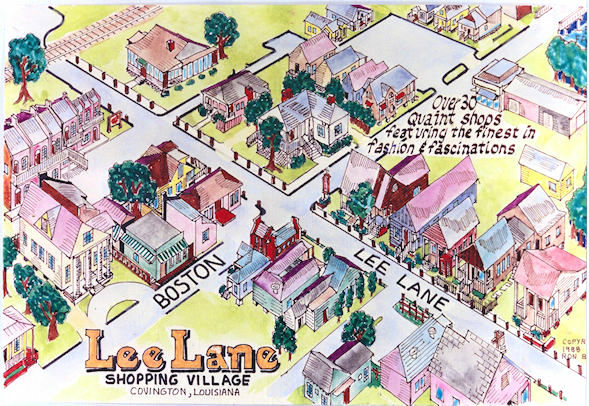 I have also drawn specialty maps for the annual ChefSoiree charity event in Covington, as well as maps for antiques shopping, recreational areas, and real estate and chamber of commerce magazines. 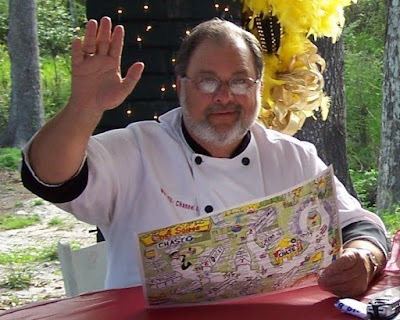 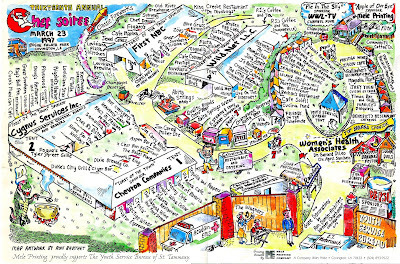 CLICK HERE to see a progression of ChefSoiree maps. The ChefSoiree maps showed where the food and beverage tents were going to be located in Bogue Falaya Park for the annual event. Frank Davis with one of my maps. 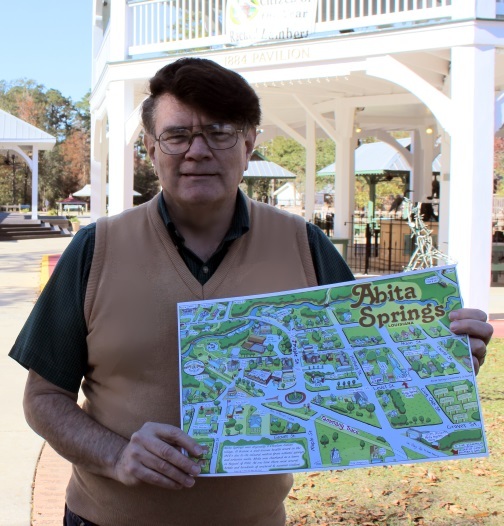 The park flooded in 2016 just days prior to the schedule event, so it was hurriedly moved to the center of downtown Covington, necessitating a last-minute rush drawing of a completely new map for the new location a couple of days before the ChefSoiree. 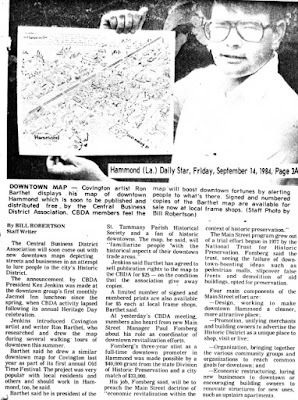 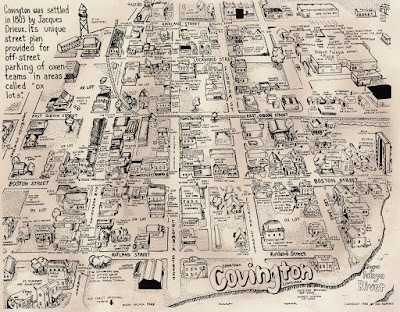 My first map was in 1984, showing downtown Covington. It was expressly made to show the locations of music and arts and crafts demonstrations being offered by the Olde Towne Festival. 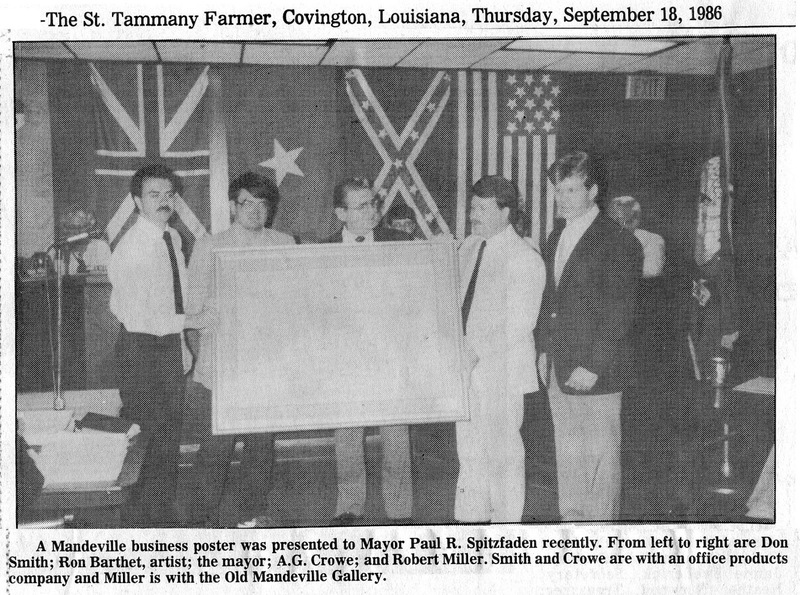 It was so popular that I printed up 800 copies and sold them, then I printed it in the Times Picayune as an ad for downtown Covington shops. 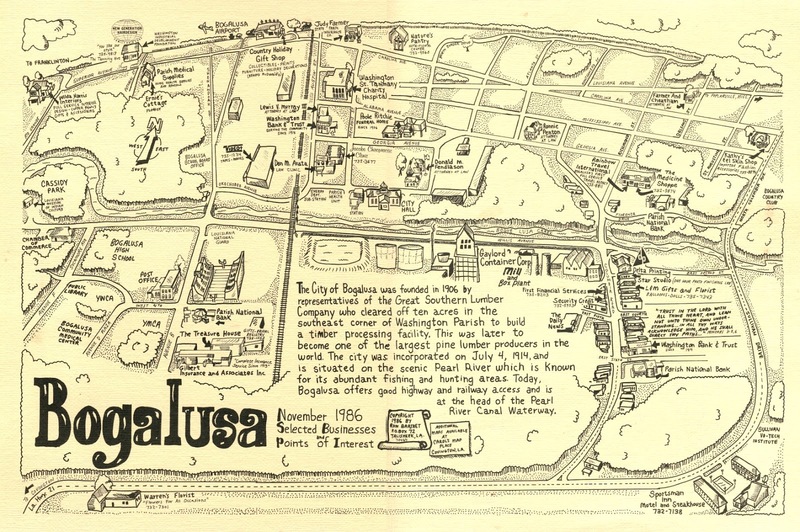 It was published after the fire destroyed Bogue Falaya Plaza Mall, but I decided to keep the map showing the mall as it was in 1983 to serve as a reminder of what was located there. 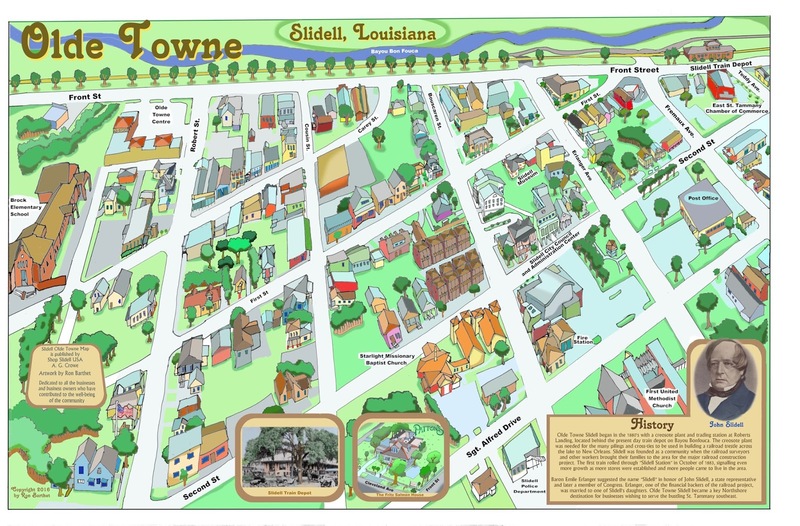 Currently, I am drawing maps and doing business illustrations for the Shop Local USA website run by A.G. Crowe of Slidell. 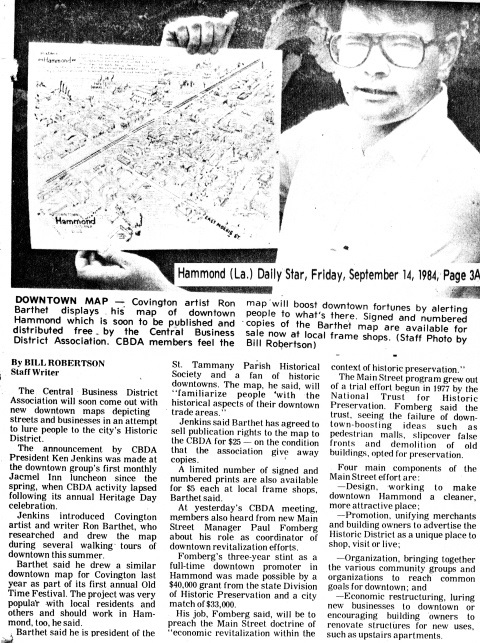 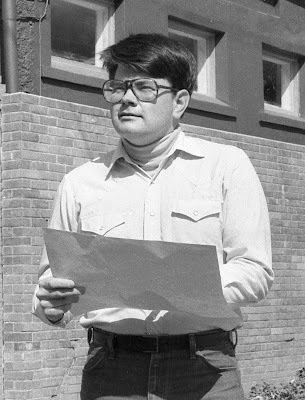 When I first met him in Slidell in 1985, A.G. Crowe was running St. Tammany Office Products . 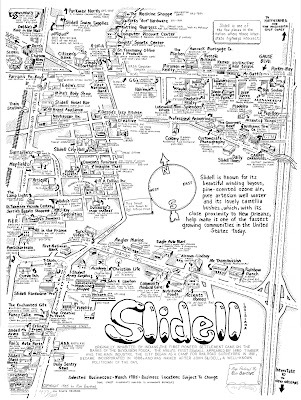 I came in to his store to show him the map I was doing of Slidell asking if he wanted to advertise on it. 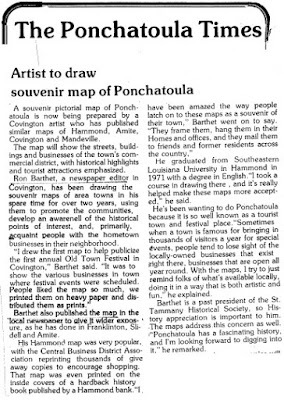 Not only did he want to advertise on it, but he wanted to get together and draw a bigger map that took in more area. So he and I began our long-time collaboration of producing maps of area towns. 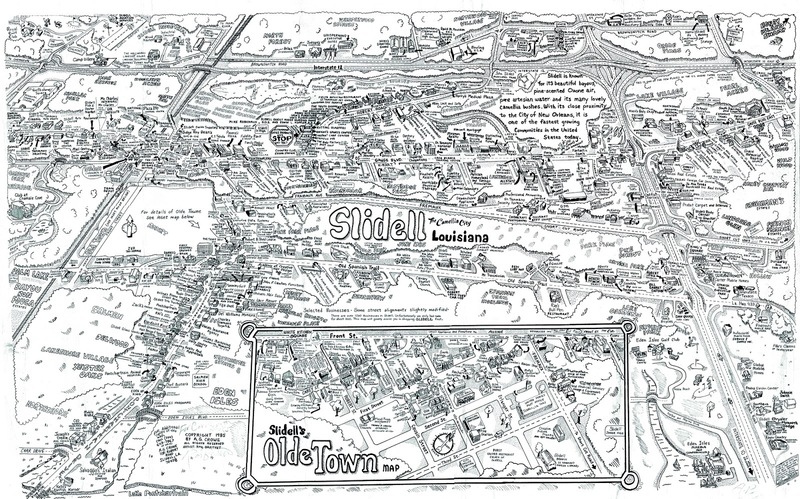 The new map of Slidell was 6 feet by 4 feet, and was printed at 3 feet by 2 feet, and it was a great success. 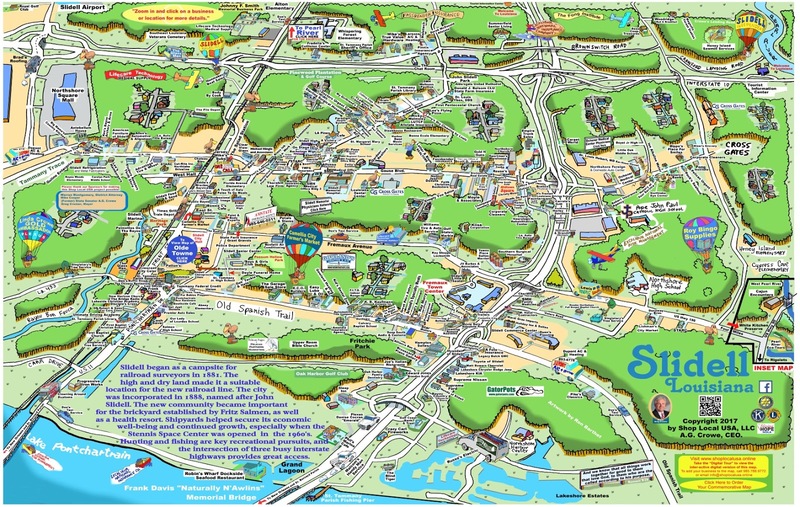 There were around 500 businesses that advertised on it, so A.G. and I spent a couple of days just proofreading the names,buildings and location of those businesses on the finished map before it was printed. 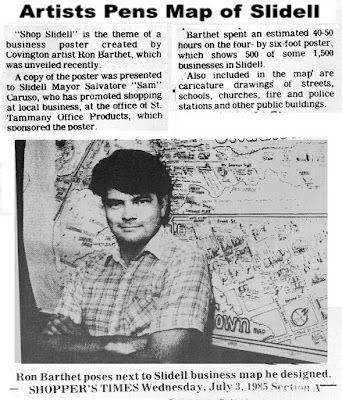 We even did a "map signing" with the artist sitting at a table in the main aisle at K-Mart, in full view of customers as they walked in the door. 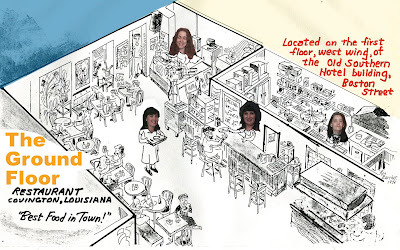 One of the persons who walked in the door was one of my cousins who I had not seen in 20 years. 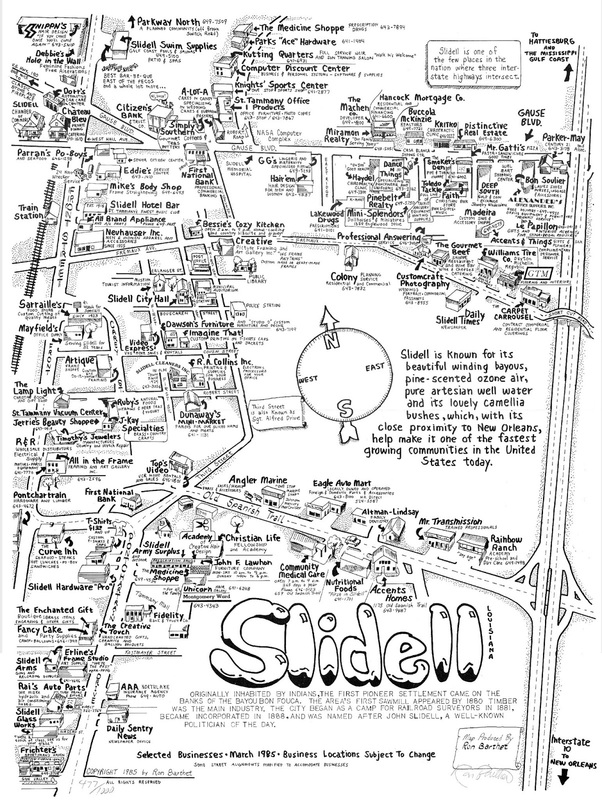 The Slidell map led to other maps. 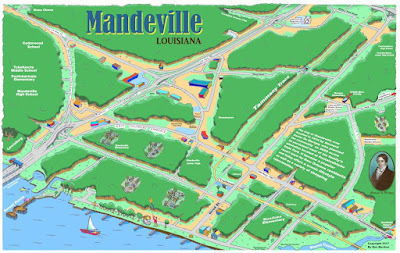 I had already done maps of Covington, Mandeville, Lacombe and Pearl River, so A.G. decided we should redo maps of Covington and Mandeville in a larger sized format, as well as Hancock County, Miss., and New Orleans East. 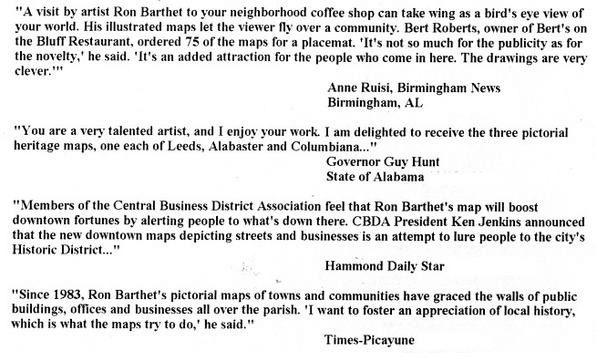 Twenty four years later, in 2016, A.G. Crowe contacted me about doing maps together again, following his career in the Louisiana State Legislature. So we started re-doing some of the maps we had done in the 1980's and 1990's. 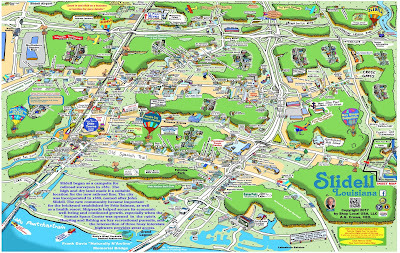 This time, however, instead of just printing them, we scanned them and put them on the internet, with "hotlinks" on the businesses named so the web surfers would click on the links and then be directed to their websites. 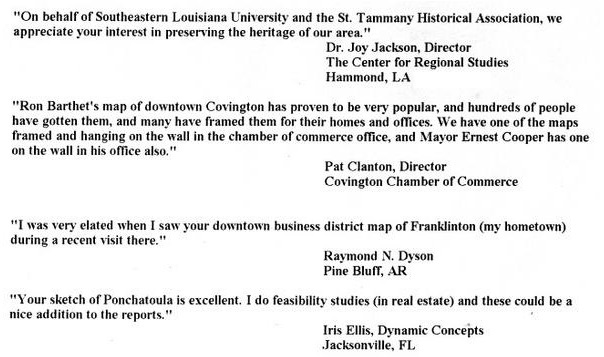 If they didn't have websites, then we would put up a specific page showing their business with their street address and phone number. 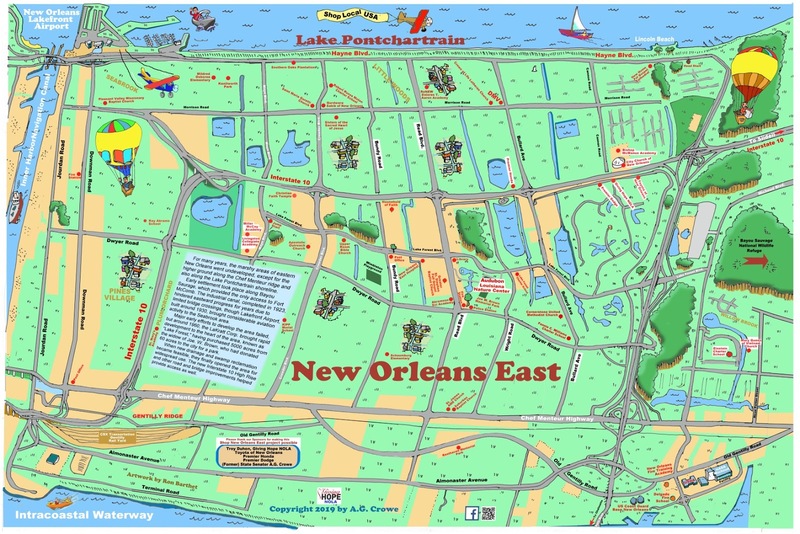 We did an update of the New Orleans East map in 2019. 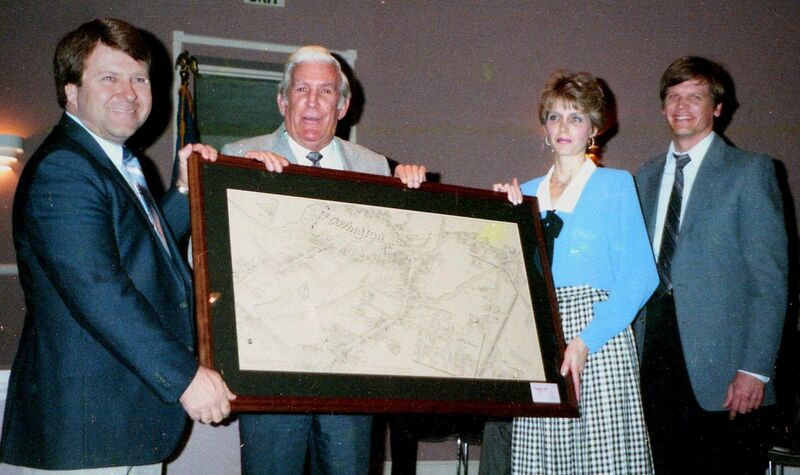 Here is a photo of A.G. Crowe (at left) presenting Mayor Ernest Cooper of Covington with a framed copy of the 1986 Covington area map which included Abita Springs and Hwy. 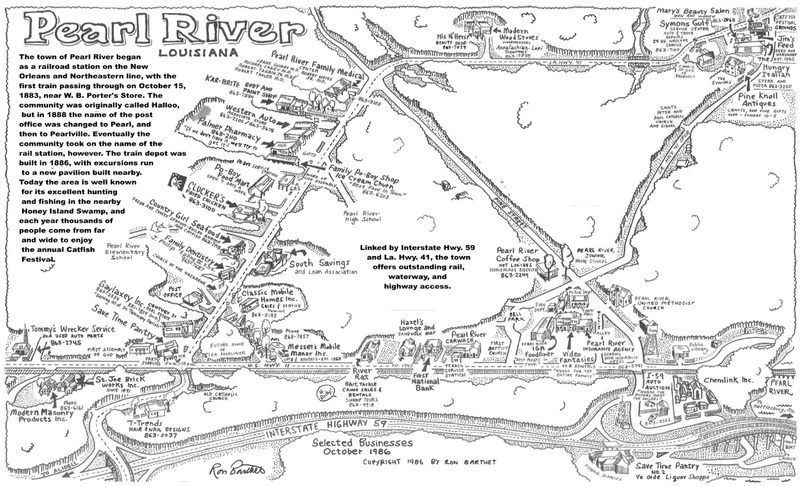 190 down to the interstate. The first St. Bernard Parish Map was done in 1991. 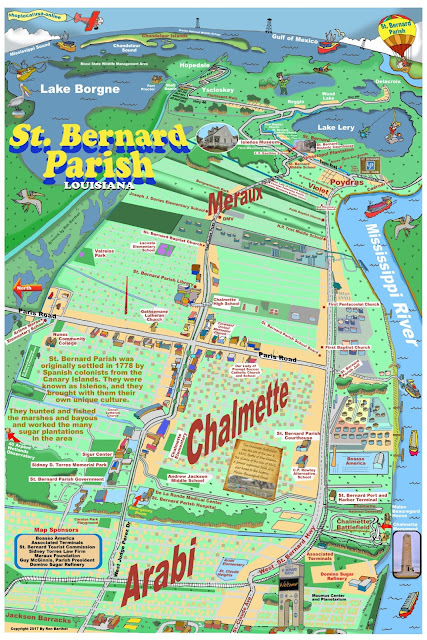 Here is the 2018 updated St. Bernard Parish map. 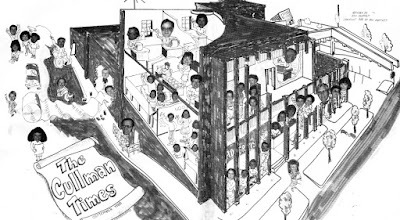 Click on the images to see them larger. 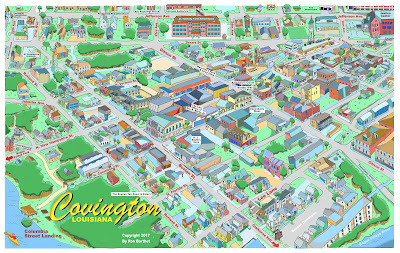 The new Covington downtown map was done in 2017. 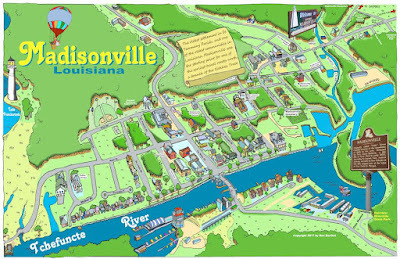 Although I done two earlier Madisonville maps in black and white, we decided to do another one in 2017, this one in color. 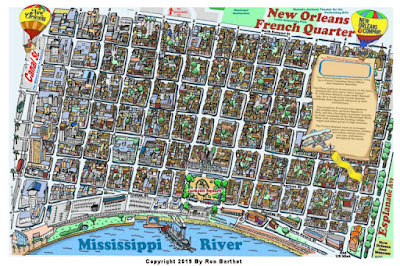 Over the years, some of my map illustrations have been printed on T-Shirts, drinking glasses, Mardi Gras cups, placemats, school textbook covers, billboards and even hardback book endpapers. 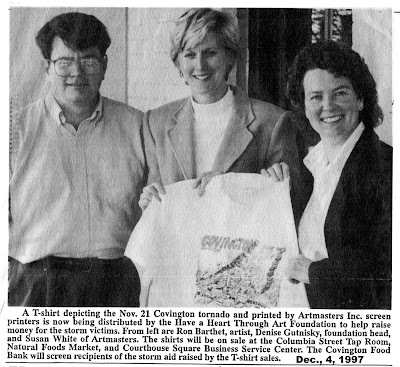 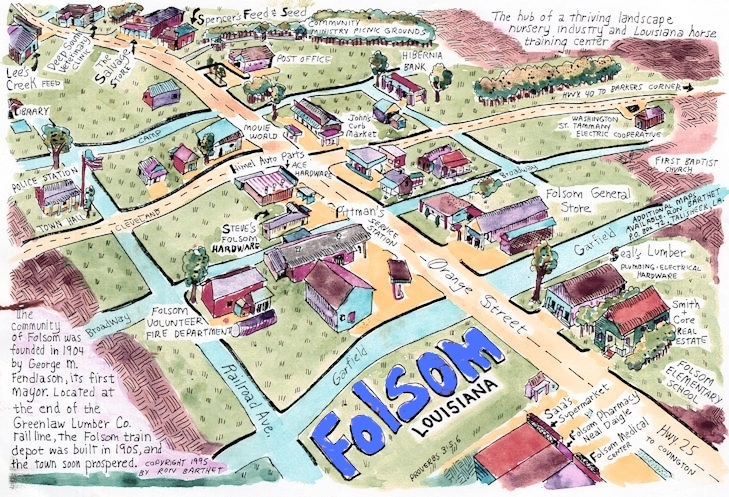 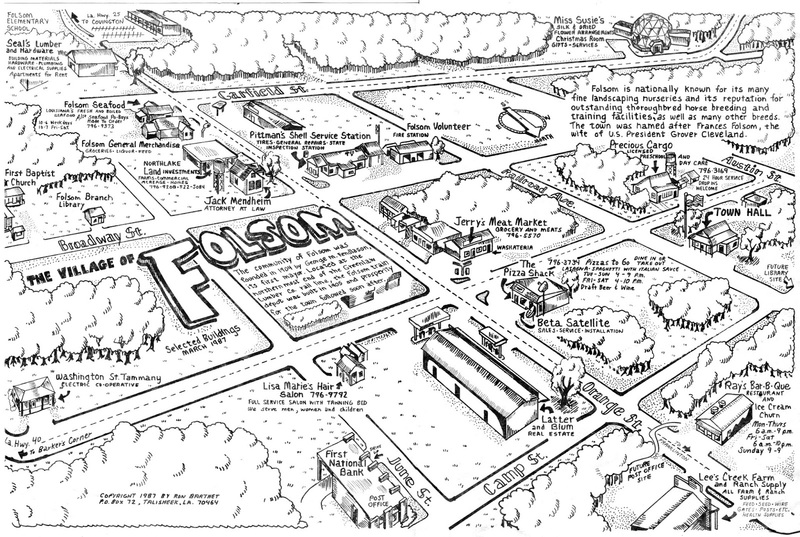 In Folsom, beginning in 1987, I produced the first of three maps. 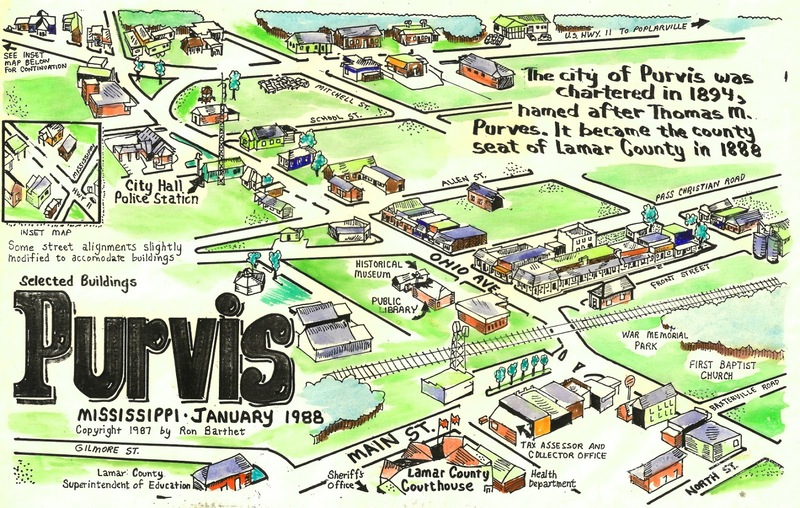 In 1995, the one pictured below depicted the town in the present time, and then a few years later, another one was produced that depicted the town back in 1903, the year it was founded. 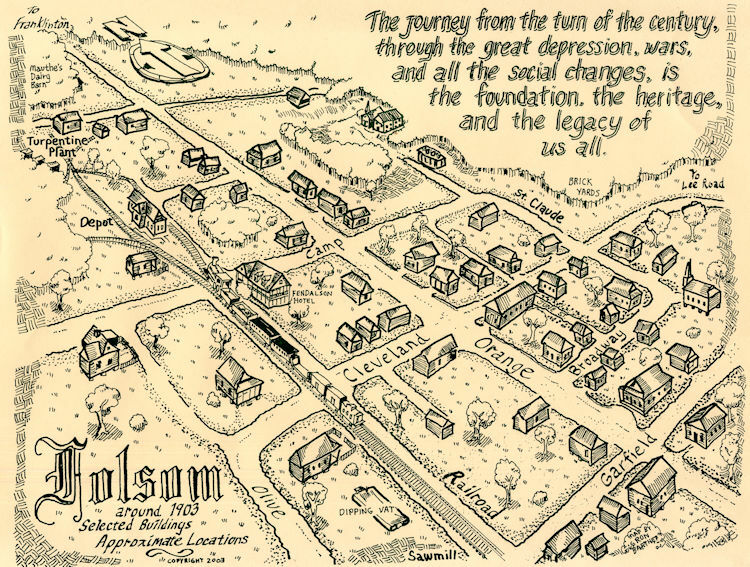 That map was based on historical writings, photographs and resident recollections. 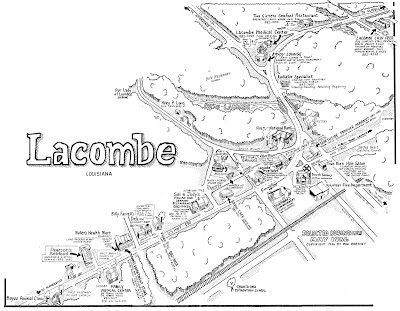 for placement on a billboard next to their Long Leaf Trace trailhead. 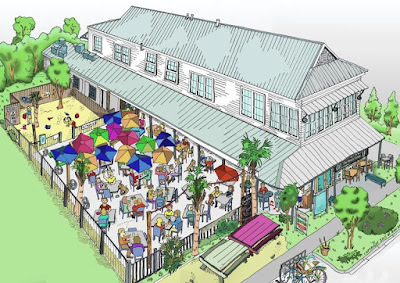 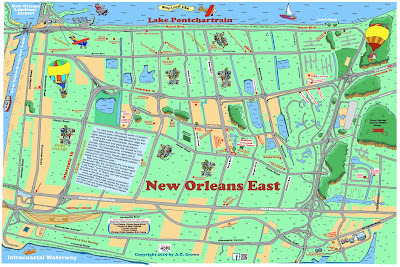 In 2016, the Lake Pontchartrain Basin Foundation asked me to do a map showing the recreational facilities along the lake's south shore in New Orleans. 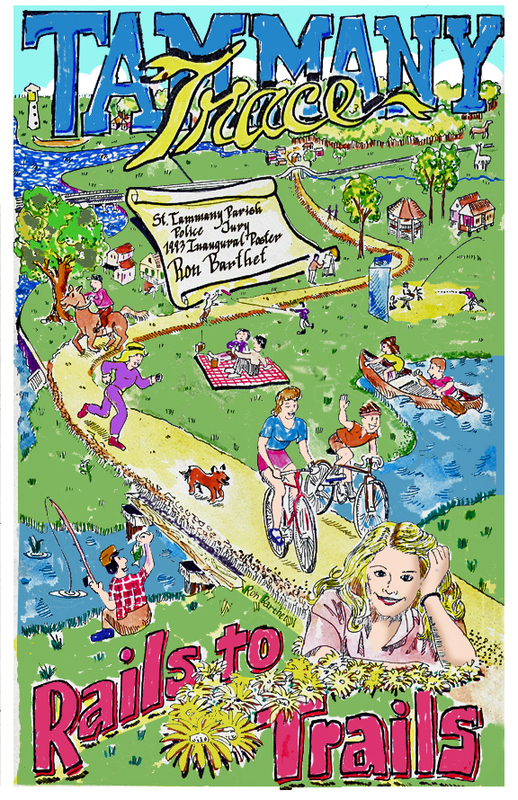 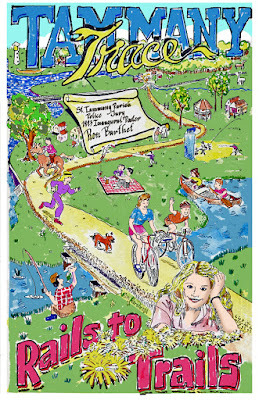 Back when the Tammany Trace Rails To Trails project was first proposed, I drew a poster to depict the type of activities that would be popular on the Trace. 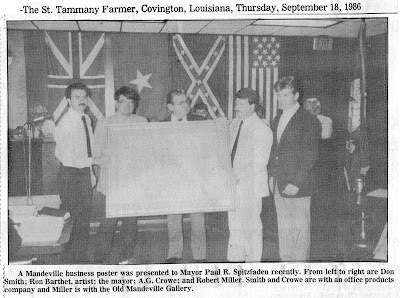 The organizers used it as the "inaugural poster" and gave it out as prized souvenirs at one of the first meetings on the bicycle/jogging pathway between Slidell and Covington . 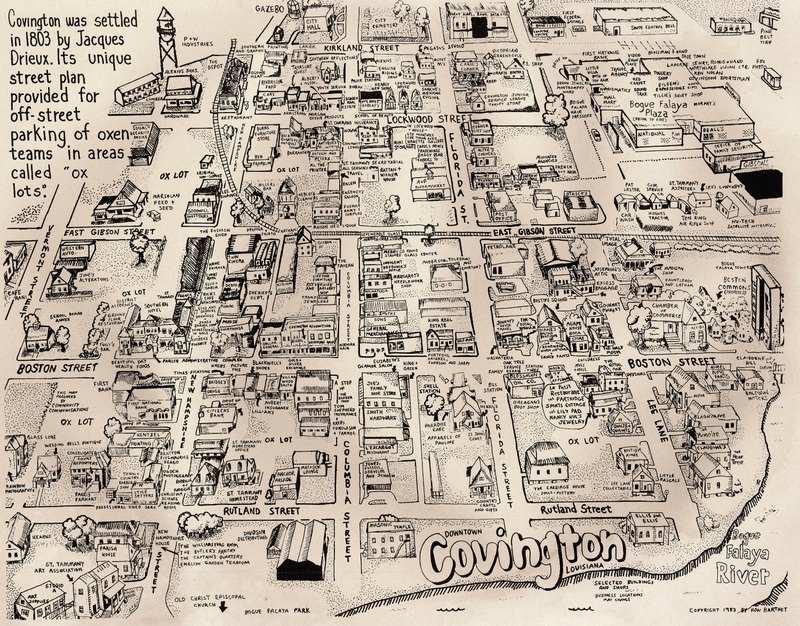 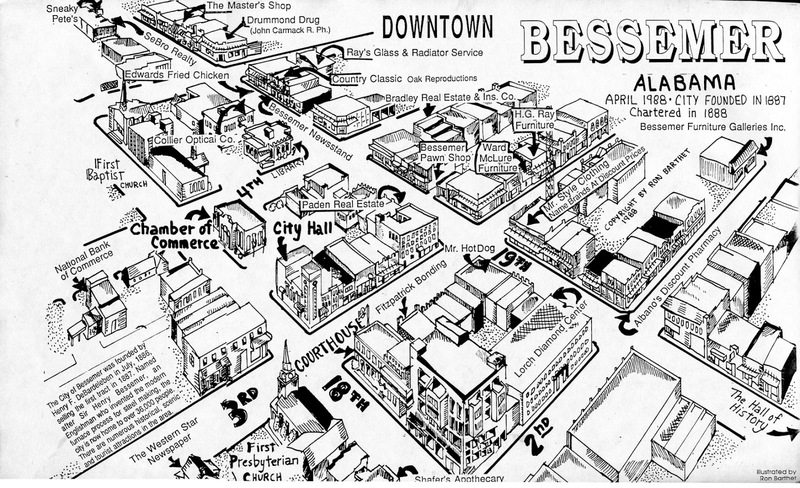 Shown above is the Tyler Street portion of a Covington area map drawn in 1986.Quite a few of the businesses illustrated have changed locations since then. 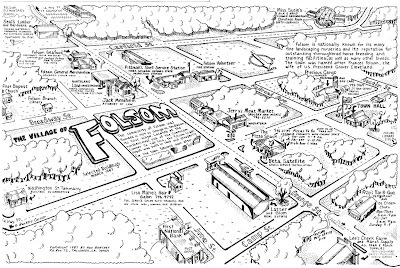 Click on map for a larger resolution version. 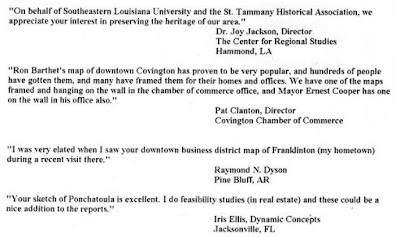 Not all businesses were shown on the map. 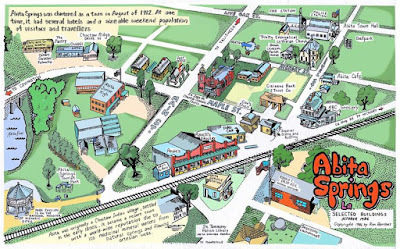 In the 1980's and 1990's drawing the pictorial maps required a lot of walking and drawing, hundreds of rough sketches of buildings. 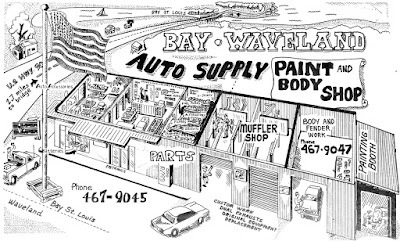 Each building had to be drawn from a couple of different angles, with close attention to roofline ridges, doors, windows and steps. 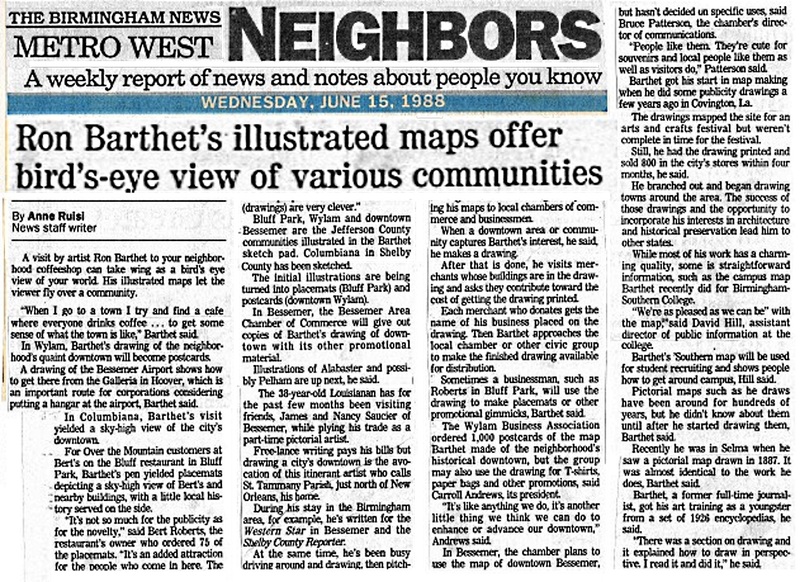 The maps were black and white, so the exterior colors were not that important. 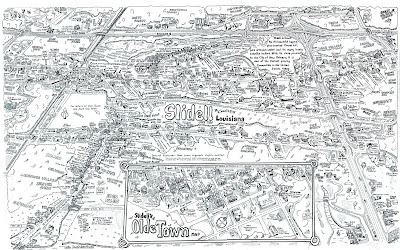 It would take me about two weeks of walking around a town, sketching all the buildings, to get enough information to go home and draw the finished map. 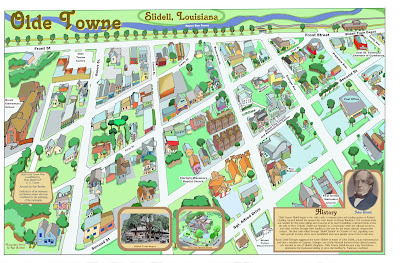 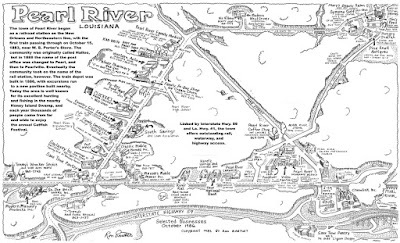 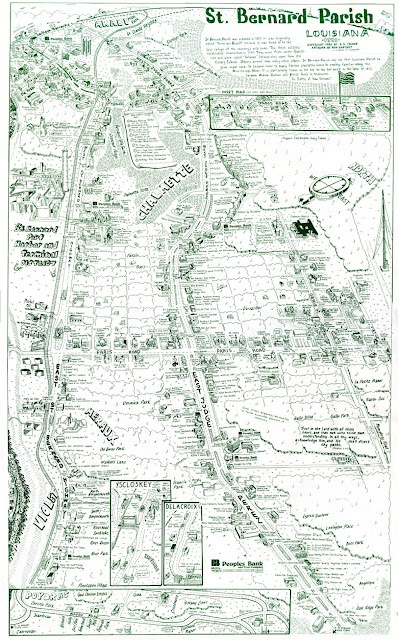 ​Working with A.G. Crowe in Slidell, I produced several large-scale pictorial maps of Slidell; Hancock County, MS; Covington/Mandeville; New Orleans East, and St. Bernard Parish. 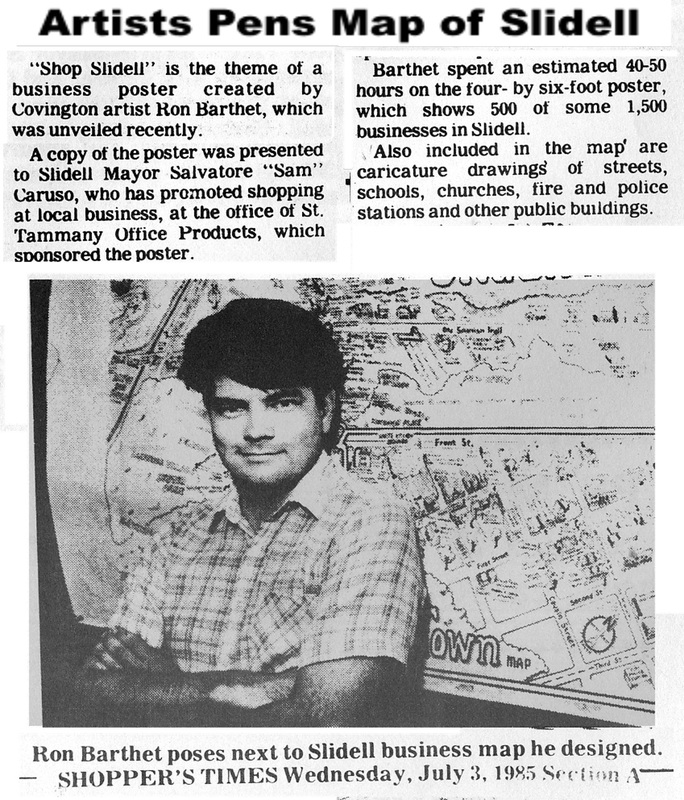 Each of those were poster sized three feet by five feet. 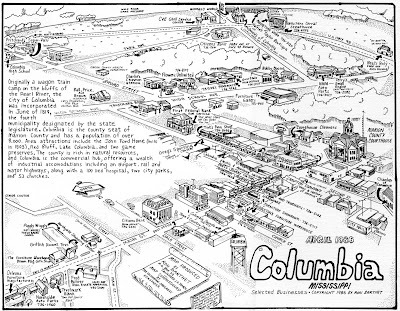 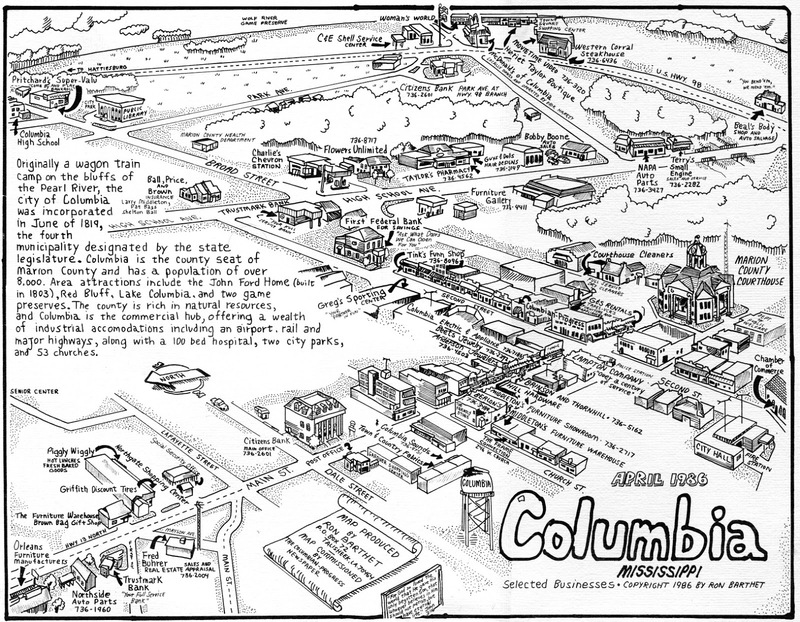 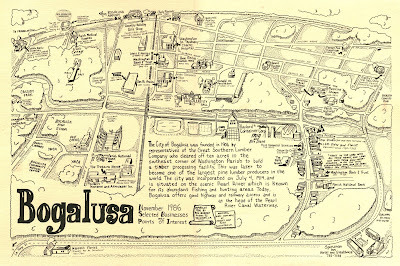 In the late 1980's Birmingham-Southern College called me in to do a pictorial cartoon map of their campus. 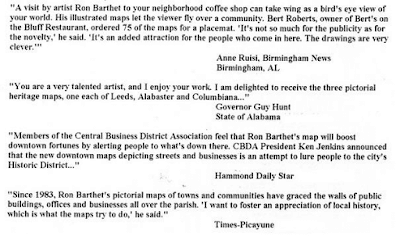 I had earlier stopped by the Birmingham area street map publisher to tell him I was in town doing cartoon maps (as a professional courtesy I suppose). 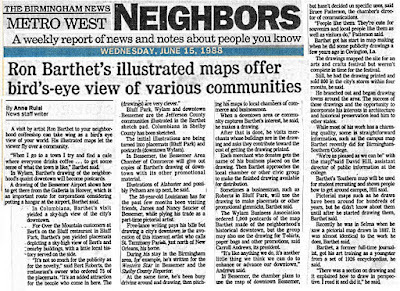 He called me a few days later telling me that Birmingham-Southern had contacted him about doing a birds-eye view of their campus, but he referred them to me. 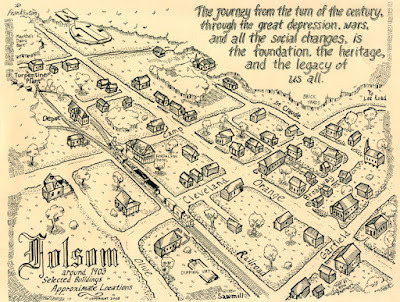 I appreciated the recommendation. 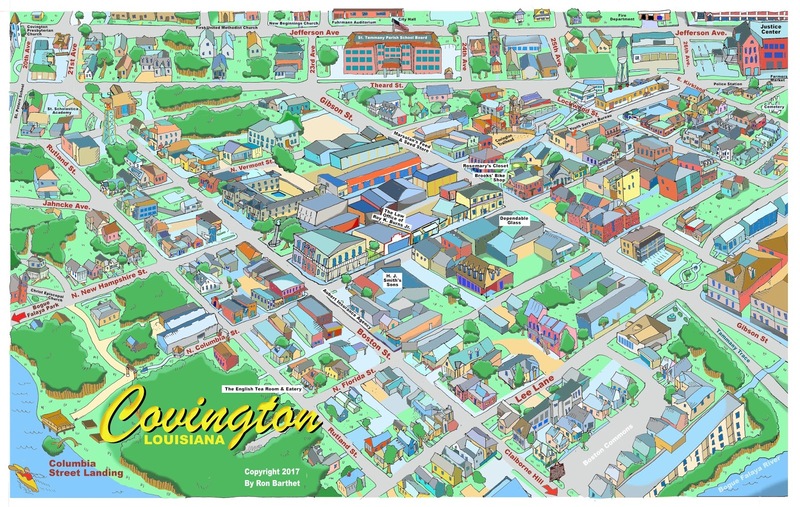 I have always had a respect for the local street map publishers because of their never-ending task of updating their maps with new streets and new subdivisions. 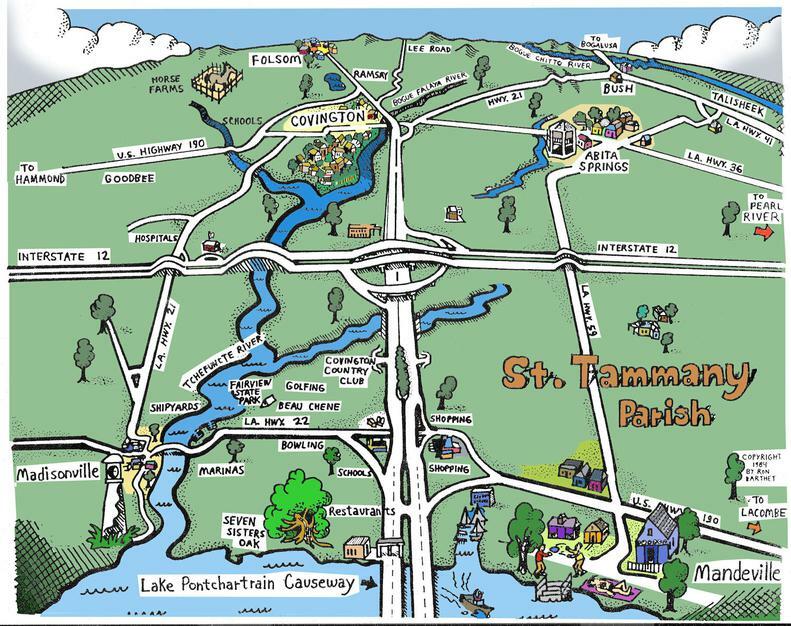 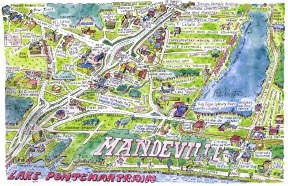 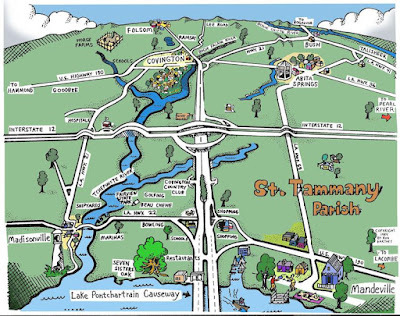 This west St. Tammany Map (above) was done in 1997. 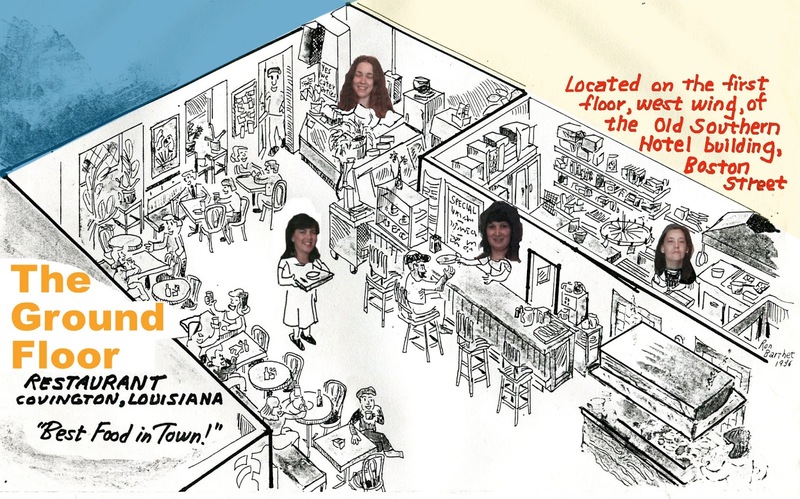 The Ground Floor Restaurant was located in the Southern Hotel building in Covington. It was one of the several maps I have done of the interior of buildings with cartoon people looking up at me. 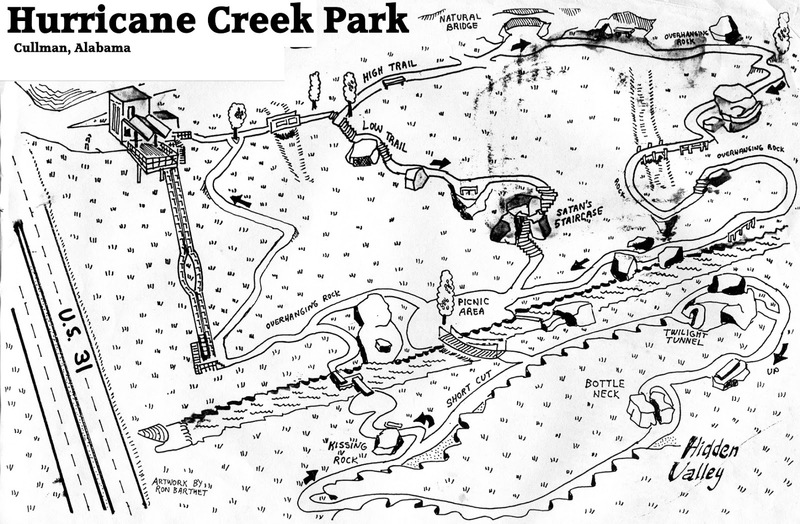 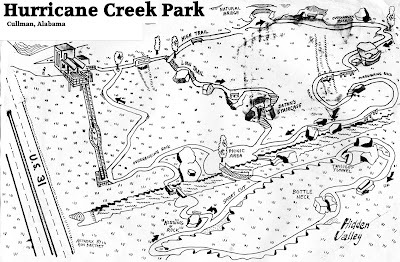 A map of Hurricane Creek Park, my favorite place to visit in Cullman. 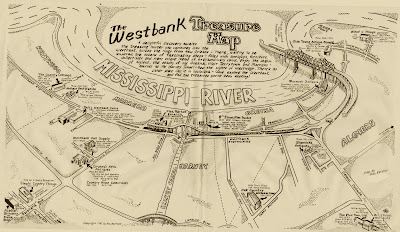 Click on the "Digital Tour" tab to see a list of maps. 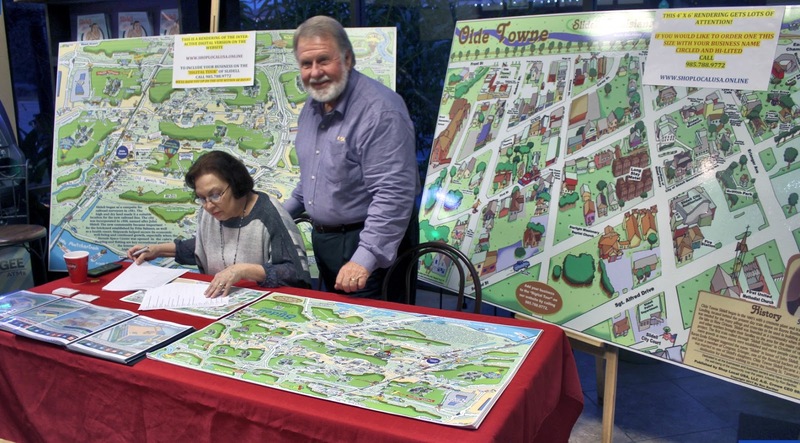 A.G. Crowe and his wife at a Slidell Chamber of Commerce event where the large scale maps were unveiled showing Slidell and Olde Towne Slidell. 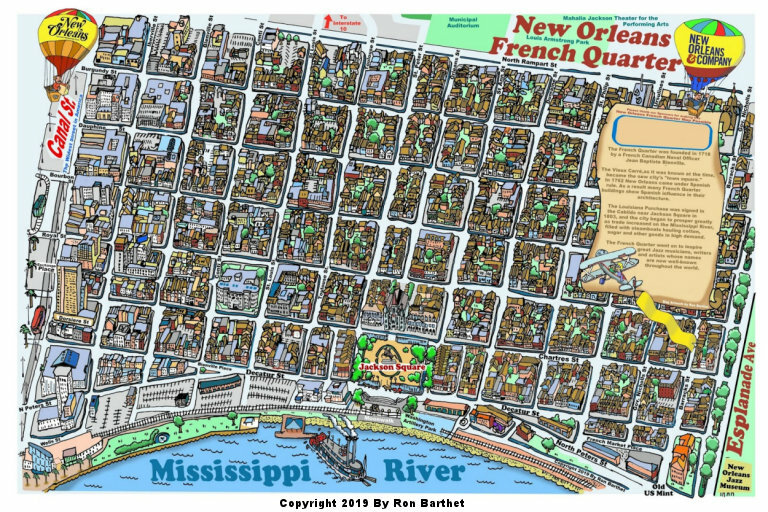 In March of 2019, I drew a map of the New Orleans French Quarter, complete with every building between Rampart and Decatur and Canal St and Esplanade Ave.
Below is a video showing the drawing of the French Quarter map and its coloring sequence. 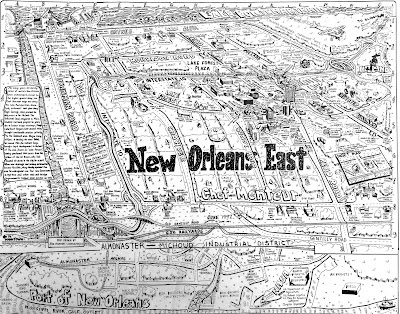 Click on the play triangle in the center to start the video. 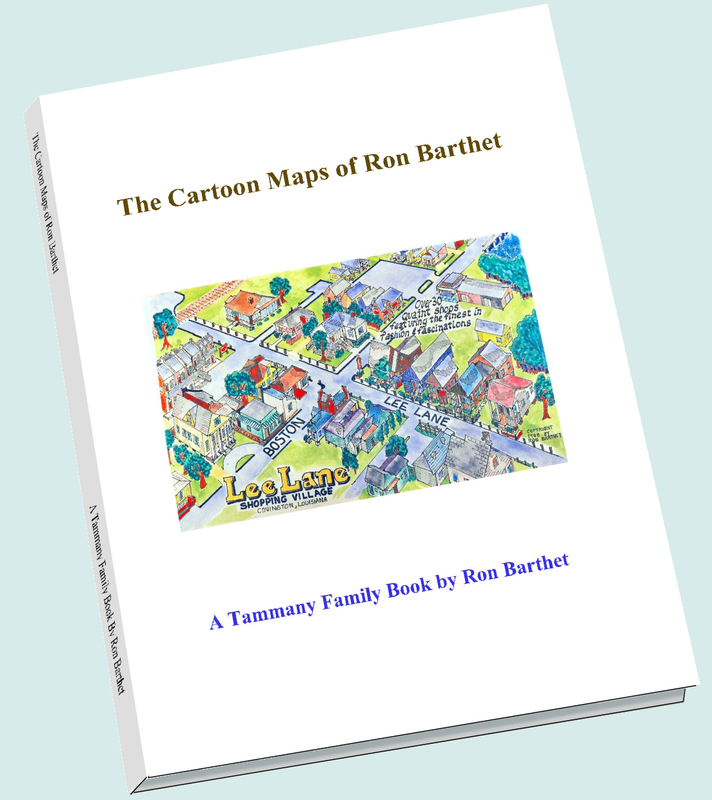 I just published a collection of my cartoon pictorial maps from over the past 35 years. 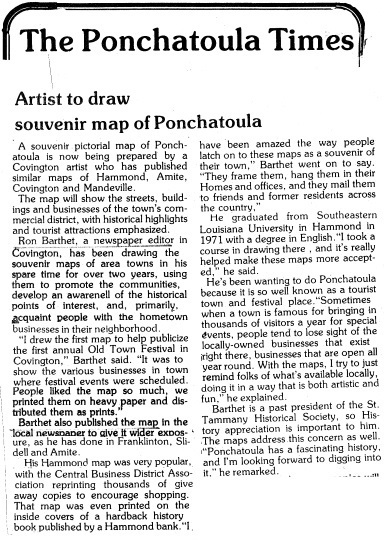 It's interesting to see some of the maps as they were printed back then, the towns, the downtown business districts, the parishes, counties, and even some individual buildings. 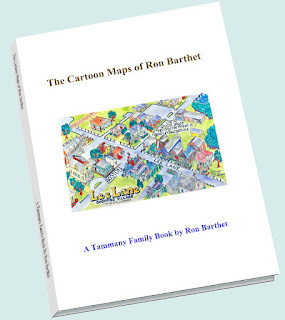 The book measures 8 1/2 by 11 inches and runs 50 pages, many of which are in color. 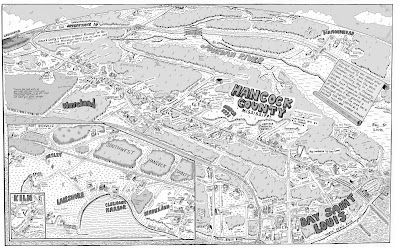 The maps were originally printed 11 x 17 inches on up (as big as 3 feet by 5 feet), but they have been reduced in size to fit in the book, so some of the map printing will be pretty small. 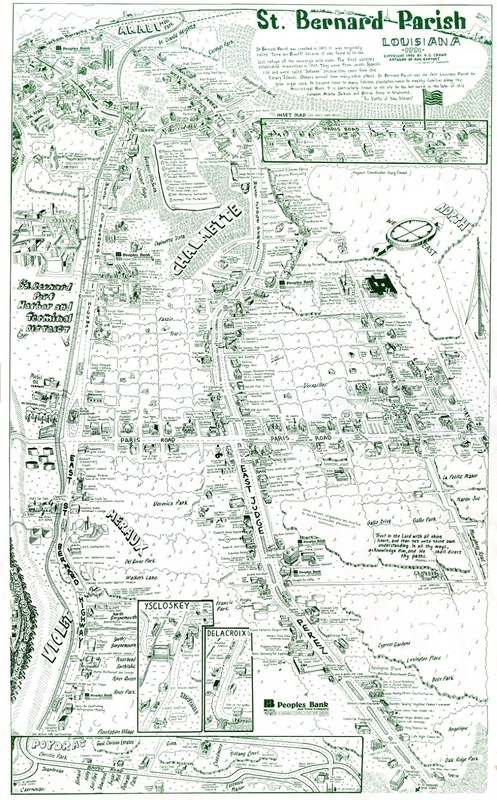 The book aims to give an overall review of the maps. 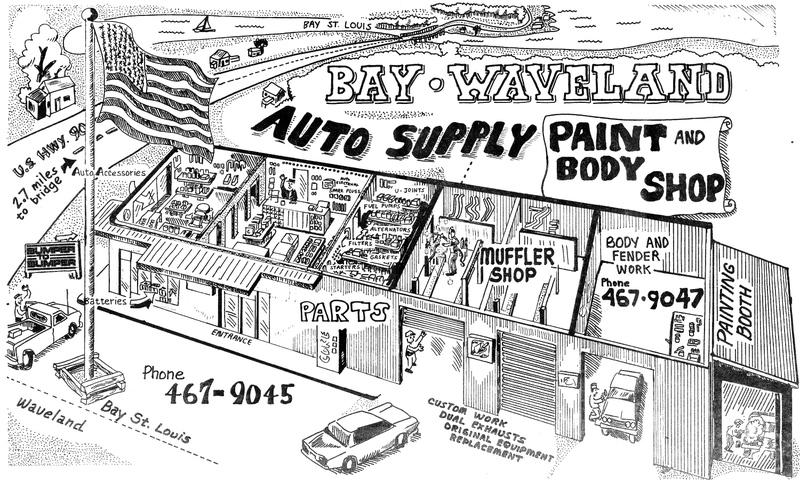 Most of them are out of print in their original sizes.